Society's expectations of business are fundamentally changing. Now more than ever, the public demands corporations take on increased responsibility for their social and environmental impacts. And many people would like to see corporations provide leadership to address key social challenges. In response, some companies, including Intel, are exploring new and innovative ways of integrating social leadership into core business strategies and operations. For Intel, such initiatives include narrowing the digital divide; improving performance in science, technology, engineering and math (STEM) education; and equipping teachers with critical skills they need to support twenty-first century learning. Intel established the Intel Foundation in 1988 to improve the educational opportunities and quality of life for communities worldwide. Over the years, the Intel Foundation has helped fuel innovation in classrooms, empowered women and underserved youth, and enabled Intel employees to serve the needs of their communities. By developing programs and providing funding for national and localized grants, the Intel Foundation, in collaboration with Intel, strives to advance math and science education while helping to build a workforce that represents the diversity around the world. The role of corporate foundations has undergone a fundamental shift in recent years -- the traditional view of a corporate foundation being a separate entity from the business and acting "strictly as a charity" has evolved into the new view of a corporate foundation as an organization integrated within the larger context of business goals to create "shared value" (encompassing both business and social value). This article discusses how Intel and the Intel Foundation align social and business goals in their approach to their mission and programs, and how they measure and evaluate the impact of such initiatives. The article also details the evolution of the foundation and how it has worked in relation to the business, the development of the foundation's measurement and evaluation processes, and some lessons learned in the process. 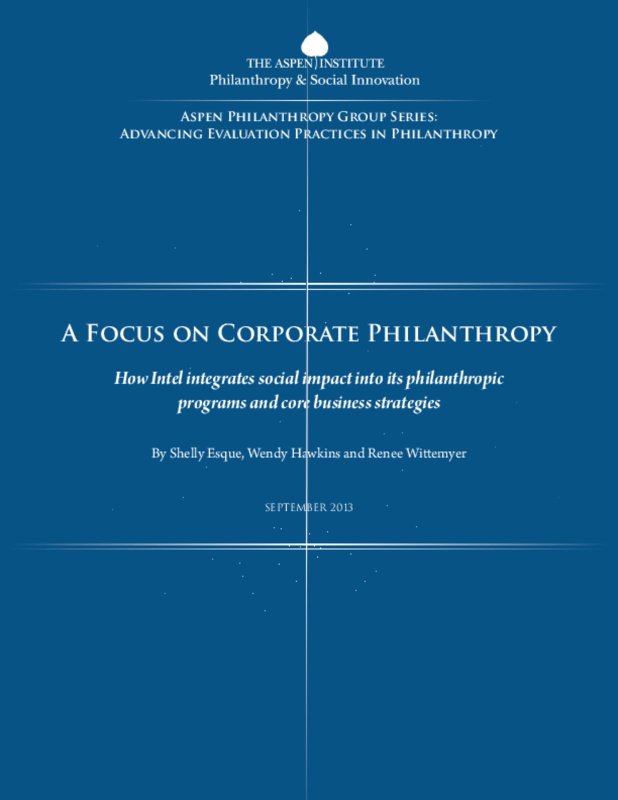 The article makes the case that corporate foundations and corporate giving efforts must adapt continually to changing circumstances. Copyright 2013 Aspen Institute Program on Philanthropy and Social Innovation.